A decorated police officer with the training division and SWAT team of the Greensboro, NC police department. 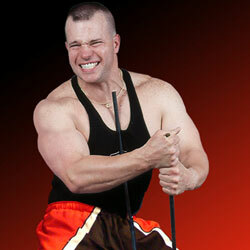 He is a former East Coast Natural Bodybuilding Champion. He has studied various forms of martial arts and is nick-named "No Fear" by his teammates because of his heart and desire to try anything, as well as his ability to drive his head through walls of solid concrete and ice. Alan loves sharing his testimony and time with others. His message for us today is, "Let His light shine through you. Always remember John 3:16 and spread the word." This athlete practices what he preaches!